Thank y'all for your inspiration to keep a busy lady still quilting!!! A true passion of mine and I am grateful for the Turning Twenty patterns to make quilting fun and time efficient!!! You are truly a blessing and I have been using your patterns for years!! Thank you for your excellent customer service. It's a real pleasure to make purchases from your site/company! I am so impressed with the quick response. I love your products. Thank you! You are Customer Service with a capital CS. Thank you for always making sure that the orders are right, that the customer is satisfied, and that the shipment is timely. I was standing at the mail box waiting today and was not disappointed! My order arrived and I am ready to do some machine embroidery. Thank you for your quick service and I look forward to meeting you at the George R. Brown when you are here for the Quilt Show in October. Thank you again for your beautiful designs. Thanks for the speedy delivery of cd and booklet. Your tribute to Gary was very touching. Your guys are tremendous - I can't believe how fast your shipping , etc. is. Hi, just wanted to let you know my book & ruler - turning twenty - arrived today & to say thank you for the surprise free book. I have made your Turning Twenty Around the block Black and white and everyone just loves it. My colors are blue and aqua. Thanks for the patterns. I just wanted to say thank you. I received the order today that I had placed last Friday night - I was totally surprised to receive it so quickly, in excellent shape and with a free gift. Received my order very fast and I love the books. Thanks. My Monkey's Uncle came in yesterday's mail. Talk about fast, that is fast. I will enjoy making them for St Jude Children' Hospital. I am going to make 4 small ones, 40x 40 or so. The Jingle Jangle Jungle quilt kit arrived today. Thank you for such good service! I look forward to making the quilt. It is so cute! I like the picture of you on your website. You look just as nice and friendly as you did over the telephone recently. No wonder your business is called FriendFolks. I was at the Dallas quilt show & was able to meet your daughter & granddaughter at your booth. I was very pleased to see the great selection of your books & of course I bought several more! You may not remember me, but I was at the Prayers & Squares convention in Lewisville in 2008 when you spoke to us that Friday night. I was the face that you "focused" on during your talk about how God helped you get where you were. It was a very emotional evening for all of us! Our ministry has just became a chapter the year before & the convention was an added bonus! In May we will celebrate our 6th year as a ministry & chapter of Prayers & Squares. We have 30 members & have given out over 1,300 quilts so far! We have used many patterns from your books & I cherish the ones you personally signed. I just wanted to let you know what an inspiration you were to us that night & please keep the books coming!!! Thank you so much. I enjoy your patterns. The one I am making now is for a wedding gift. They are wonderful especially when I need something quick that really turns out lovely. I just received the order for a couple of patterns today. I couldn't let the opportunity to let you know how I felt about this order. Received my package today. Thank you for sending the pattern I ordered and thank you for the free gift of 'My Best Sunday Bloomers Book'. Love the stuff in it. Can't wait to make something. Today I received my first order I have ever placed on your website. I fell in love with Turning Twenty books years ago, but wanted to make sure that all know that shopping your website was easy and receipt of product was fast and I used regular postage. Can't wait to get busy! I just looked at all the show and tells. You have been such an inspiration to so many. They are all so proud of their achievements. It has certainly been a long time since our early days at RRQG (Red River Quilters Guild). I am mostly doing small wall hangings for my door. Love the new Snowman Redwork. Do the brush color pens have a pen on one end and a brush on the other? Your mothers "Late Bloomer" has done such a terrific job designing. Keep up the good work! I received "Turning Twenty book 1" today at 12:20 PM EST. It is now 5:55 PM EST and I have completed my first ever quilt top! I went with six blocks since it is my first quilt and I didn't want to be overwhelmed. After dinner I will finish it up. Thanks so much for an easy pattern that even a beginner can follow! I couldn't believe my package came today (Wednesday) after ordering on Monday. Now I can finish my quilt top in time for show and tell next Tuesday. Thank you so much for the Miss Bunny's Show and Tell. I am just starting applique and will love making the flower basket. Also, I chair a group for Quilts for Kids and we are meeting this Friday. We had a request for pillowcases from our local hospital but I'm going to get some of our quilters to make the Buttermilk Pie quilt. These small quilts make great covers for the preemies in isolettes. Today was like an early Christmas, thank you so much. I finished Sunday School Singers in a simple quilt and they are wonderful . I purchased A Day In The Life Of Mr. Bear today. My daughter is having a girl in April and the bear one will be for her. Great job. Just wanted you to know that my copy of 'Turning Twenty Just Got Better' arrived today. The instruction book easy to follow. The quilts are beautiful. I have collected a lot of fat quarters and can see myself trying all these quilts. Thank you so much for your prompt reply to my inquiry; wow, personal attention on an internet order!!! Rare, indeed. You can be assured that I will make all my friends aware of your wonderful website. My goodness, I didn't expect the break on postage, what a nice thing to do. I was just unaware that the weight was in oz. rather than pounds; thanks for the explanation. I have just starting to use your designs. Sunday School singers and Love covers. I have never had stitching so nice. The pieces will look awsome when I get them all put together. Great work. I will be watching for more. Just wanted to let you know that I love, love, love your Best Friends Forever embroidery designs. I especially like the applique procedure. The tack down stitch makes it super easy to clip around the applique. This is just to let you know that our Hudson River Quilt Guild is having a "my favorite quilt pattern" show and tell in November. Your Turning Twenty is mine. From your first book, I have already made 4 quilt tops using 20 fat quarters, am machine quilting one of them now, the other three are coming up, but I've just cut out the one using 9 fat quarters for the coming arrival of a niece's baby girl. I have never used a pattern in all my years of quilting that is so precise. It practically fits together blindfolded. I have 17 grandchildren, so it's wonderful having a pattern that is so beautiful, yet inexpensive, fast, easy, and -- as I said before -- precise. I'll send you photos of the above mentioned quilts in the future. Hopefully they'll all be quilted soon. I have a Handi-Quilter, so the quilting does go pretty fast. I have 4 of your books, so I'm looking forward to using the others, too. Best wishes, and thank you for sharing your wonderful patterns. The material was shipped quickly and received beautifully. Thank you so much for the message. The CD is a gift for my mom for Christmas...one she has been wanting for a long time! Thank you again for the quick and friendly service! Just wanted to thank you for sending my order so quickly. It was so carefully packaged and arrived in perfect condition - many thanks. I got the Love Covers software today. Not sure I can sew fast enough to stay up with your neat ideas. I'll start on my Western Turning Twenty tomorrow or Friday. Love Covers will follow close behind that. Then I want to create one using embroideried Winter birds for my focus blocks. I'm only sorry I didn't start making Turning Twenty quilts sooner. Wanted to let you know I received the Super Man's Quilt kit, books and template on Saturday. Thanks for the really fast delivery. The books arrived in today's mail, and I've already found several quilts in the books that I'm adding to my I HAVE TO MAKE THESE! list. Your service is wonderful. Thank you so much for your friendly and efficient service. What a nice shopping experience! Just wanted to let you know that I had a turning 20 for my king sized bed and it looks great. I am working on doing a turning twenty using 9 blocks for a couple of my friends as well as a turning twenty using 12 blocks for my 2 granddaughters. This pattern is fun to do. Thanks (for the shipping information). Would you believe that I received your books in the mail on Monday? That was surely fast. I made 20 fat quarters and I am going to make a baby quilt using your method for my niece. So far the cutting was really a snap. I love it. I am going to have a Grand Opening of my shop on October 4th and I bet on the 5th I won't have any of your books left. I hope to meet you at Quilt Market in Houston. I am going to make sure and stop by your booth. Received my order today---love it, love it, love it! Thank you! I just bought your book, Quilted Pillows and it had a sticker on it to buy the CD. Can't find it on your web site. How can I get it? Excellent, Your books are wonderful, we use them for our Beginning quilting classes, kits and more. Great Job! I made my first "Turning 20" a couple of weeks ago (in Black / White with a touch of pink - looks real Art Deco - I used 20 different fat quarters). I am hooked; it was exciting to finish the quilt top in just a few hours! A friend wants me to make one for her daughter in black/white too - not sure how to add more blocks to make a queen size quilt - do you simply add more block A or Block B's or do you add bigger borders? Any help you can give is greatly appreciated. When you make a Turning Twenty quilt - just figure 1 fat quarter = 1 quilt block. You can actually make all "A" blocks or all "B" blocks to simplify the design even further.... and make 30 blocks for a queen quilt. 30 blocks also makes a king but you need to add wider (or additional) borders. You can't hardly make a mistake with the Turning Twenty quilts - all of the Turning Twenty patterns are designed for beginning quilt makers. Changing the size of quilt is simply done by either adding or subtracting fat quarters (or blocks). So, yes ... you are on the right track! Keep up the good work - I'm glad you are hooked! The world needs more quilters! Just wanted you to know how you have blessed our family. 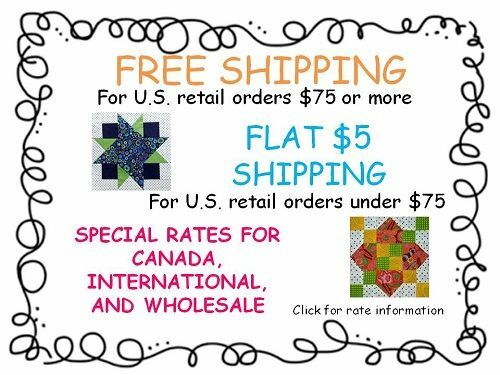 I, as a quilter give many quilts that I make as gifts, or donations to the Linus Foundation. My daughter, Katie, is 13 now. Two summers ago she made her first "Turning 12"...we did 12 squares instead of 20 so she would not become over welmed. Since then she has the same "disease" her Mother has. She has made quilts only to give them away as gifts for her friends. We were in Michigan recently in a quilt store. She spotted this fabric line and asked if she could buy enough fabric to make herself and her friend a quilt as they will be attending two camps together this summer. How could I say no? So last night I again was cutting out a "Turning Twelve" for her and a friend to sew together this afternoon. I can't help but smile...when I think of her thoughtfulness at such a young age...and what talent she has in picking out fabric. Thank you again for your part in all of this happiness we share as a daughter and Mom. Continued success in your journey of creating quilt patterns. My Canadian neighbour worked on the Funny Farm quilt, and I got your address from the back of her book. 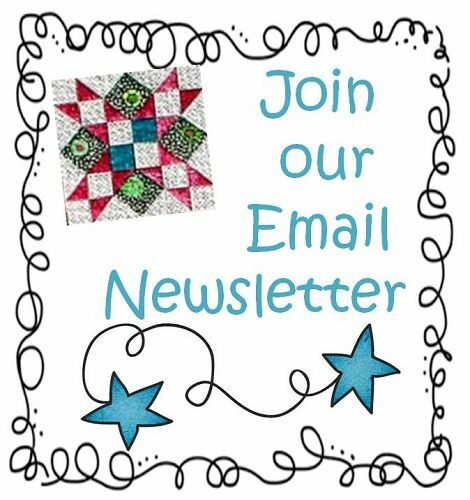 I am so eager to get this kit from you; it's the best children's quilt I've seen in years! I just bought your new Double Dippin′ Quilts book and I have to tell you, it is the BEST book I′ve seen so far! You filled this book with more of your great quilt patterns, then added runners, placemats, potholders, coasters and even a Christmas tree skirt! You′ve outdone yourself this time and I can′t wait to make them all. Your instructions are super easy, the full color photos are outstanding, and you make piecing quilts so much fun! Thanks for another great book, and keep up the good work! Just had to e-mail you and tell you that when I went to my quilt class on Saturday a fellow quilter was showing her Twisting Turning Twenty that she had just completed. She did it in yellows and burgundy. Just beautiful. I wish I would have had my camera that day so that I could show you. Mine is going to be in blues. Can't wait to start it. Thanks for creating such wonderful patterns. Keep the patterns coming, you are doing a wonderful job! I love your designs. They are my heart. I teach at UAM and have a Customer Service class and use you as a very positive example about businesses that answer emails so promptly. Thank you for the great example as well as the wonderful products. I cannot wait to get this book. Today, I was not busy at work and spent some time going thru your photo gallery on your site. Perhaps someday, I will have a quilt to show. My first quilt was a Turning Twenty and is now being topstitiched. I started this hobby at age 60 and the pillows will really give me some experience along with being wonderful gifts. You are so talented. Your books are wonderful, we use them for our Beginning quilting classes, kits and more. Our quilt guild in Bowling Green, OH is celebrating its 20 yr anniversary in 2008. As part of the years programs, we are making Turning Twenty quilts. I sold over 30 books at the last meeting and I think the group is really excited to be making these. In November we will bring our Turning Twenty quilts for show and tell. I had lots of fun making one today. It is from a VERY bright collection I have and now will be given to a juvenile that got into trouble and is spending time in the court system. Your patterns are wonderful and so much can be done with them. I just wanted to thank you for such wonderful and super fast service! My order just arrived and I absolutely love everything I received. My son wasn't impressed with a beautiful pastel kit I purchased at the Houston quilt festival year before last so it is now tucked safely away with a few other "UFOs." This quilt, however, I'm sure will win my son's approval since he can't wait to teach Shane to fish! Thank you again. I am very impressed with the quality of your service, fabrics, and products and will definitely recommend your business to others! Thanks so much. I love all your books - very well written and easy to follow. I'm a longarm quilter and simple patterns like these are so much fun to free motion quilt on. Just a quick note to say THANK YOU, THANK YOU !!!! I got my package today and was totally thrilled. Your packaging is adorable .... beautiful fabric .... a little prize pattern ..... WOW !!! What more could a girl ask for? You have made my day ..
BE BLESSED as you have blessed me. I just wanted to send you a note to let you know how much I've enjoyed the Turning Twenty and Turning Twenty Again patterns. Most of the time I do "turning 12's" since I make a lot of quilts for gifts and the size works out great. They work up so quick and really show off the fabric. I've stippled the 10 or so that I've made and really enjoyed the end product. Ooooh! Thank you so much Tricia & Gary! I absolutely LOVE the new book! It's all I could think about while I was working today. Then I tackled the mailman...he looked a bit startled...he may not be back! :) I think he thinks I have a "thing" for him now...silly man...if only he knew...I'd much rather have fabric and patterns!!! The quality of the book and the photos are awesome. I especially like the one with the lights and darks...I'm thinking maybe in Civil War fabrics??? And the black and white and red....changing the black to blue? Any thoughts there? There's no baseball game on tonight, so I hope to choose some fabric and get one cut out. Just wanted to tell you how much I appreciate the extra effort you have put forth for me...in many ways. And many, many thanks for your delightful signing, Tricia. That makes it one of a kind and oh-so-special...like YOU! I have never sewed a quilt before but today I finished a smaller version of the Turning 20 as a lap throw using only 4 different colors. It is going to be nice once it is quilted. I have all the pieces cut out for the bigger version which I am making for my husband and I. I know I will need help doing the edges and sewing the back as I have never done one before. I was planning on using the warm and natural. I took the advice in the book for the bigger one and selected 20 different fat squares with 3 color schemes. I think if will turn out nice. I read your website and the comments and I really applaud your generosity in giving suggestions. It is nice to know that there are many good people out there!! I will send you photos once they are done. I am a beginning quilter and Turning Twenty was my second project. I completed it on my own!!!! It is the best pattern. Everyone in my family will eventually have a quilt in this pattern. It did take me a bit longer to complete since I am also new to sewing and have to pin everything. But I did it. I also purchased the other 2 Turning Twenty books and I can′t wait to start another. We are in the midst of a blizzard. Thank goodnesss for stashes of fabric! I knew there was a reason for buying hunks of it when I see something pretty; nothing like being prepared! I just finished my 4th Turning Twenty quilt. I have never been so fond of a pattern; it is so very easy, fun, quick and always comes out lookin' good.... One of these days I will make up a Turning Twenty....again. That one looks fun, too! The first of the four was in nature colors for the bosses's daughter's wedding gift; the second was one in pinks for my Mom's bed; the third was one done in all black background fat quarters with flower prints (those were fun to pick out, very striking, and we kept it for us) and the last one was similar to Off to the Zoo in your book. I used purples, yellows, orange, turquoise, pink, green, blue, etc. Those fat quarters were in flowers, prints, strips and some near solids and my Mom was the recipient of it for her bed. Eventually one will be made probably in that same pattern in kiddie prints with lots of animals. Our daughter is collecting fat quarters for a quilt for her older son. His little brother will most likely get the animal quilt. I still tie these and they look great. I made the "Sunday School" quilt for a sample and it is now hanging in the "Quilting Delights" shop. The shop owner thought it would be a great project for machine embroidery beginners. 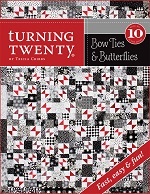 There is also a full Redwork version of the Turning Twenty Around the Block in her shop as well. I plan on loaning the quilt to the Ranch Chapel's Sunday School class when it has finished it's run at the quilt shop. Bright colors are most often my choice for kid's quilts. My granddaughter ,who will be three, thinks that all the quilts I make must be for her. I hope your viewers will try the Love Covers and the Turning Twenty Around the Block pattern. It's quick, easy and beautiful in any color pallet! I have already received the Turning Twenty Around the Block book and template and have already drooled over the photos included in the pattern! Thanks for such fast and friendly service! My favorite finish is a Turning Twenty Again that is in Mardi Gras theme...... it is on my bed now as a topper just because I think it is so gorgeous. I took a class and did a Turning Twenty in Batiks. It is still a UFO I am afraid. I decided it needed a border and have not gotten around to cutting one for it yet. I cannot wait to add this to my list of "twenty' quilts. I love your Button up Buttercup pattern! I have made 3 quilts with this pattern. The most recent - I surprised my 2 daughters this past Christmas each with one. One had pink flowers and brown diamonds - the other blue flowers and brown diamonds. They both had brown minkie backs. They are darling! Thanks for the great pattern! I just love your TURNING TWENTY quilting book. It is so easy to understand and follow. I am new to quilting and just started to work on my own. I like to read it and gather all my material and then sit and put it together how it is to be cut. My husband loved the part where he can help select the colors. I have ordered all your other books and will work on your other quilts. You are very talented and I hope in the future you can come out with more books for I will surely be the first in line to buy them. 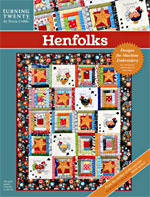 I am making a friend in the military oversea a quilt from this book. You are Heaven Sent. You've done it again. I couldn't wait till my first Turning Twenty Around the Block was quilted to write to you about it. I cut it out yesterday and will finish it tonight before I go to bed. I think I am going to call it "Sherbet" because that is what it looks like--and I used a striped chenille for my focus blocks. I will send you a picture when it is quilted. It is actually a surprise for my sister, so I won't get it back. She has a Gammill long arm quilting machine and spends all her time doing quilts for other people and never has time to do one for herself. The blocks went together like clockwork, with the exception of the ones I sewed wrong and had to take out and redo. Problem of not watching what I was doing. I was watching it snow. Thanks for the great patterns. I now have all three of the Turning Twenty patterns and hope there will be another one. Well guess what....... I have an addiction... to your fabrics, over the Christmas break I set aside time for myself to cut out the quilt and I have finished it today Jan, 5th 2007, on the label I put " made with love and laughter by Mim". You are so right when you said that you can't help but smile and feel happy when making this quilt. I have just bought some fabric bundles from your store so if you can watch out for that order that would be great. I will take a photo of the quilt and send it to you, as it was bigger than I had expected I'm going to keep it at my place and the grandchildren can sleep with it when they have a sleepover. I just purchased your latest "Turning Twenty book #3"....Its wonderful!!! I recently purchased your book, Love Covers. It is soooo great. I have already hand embroidered three of the pictures and love them. My granddaughters, 11 and 13, are starting one for themselves and are loving the experience of learning to embroider. Thanks so much. Look forward to getting the disc (Love Covers Machine Embroidery CD) for my machine also. I found your books in Wichita Falls, TX. Thanks again for the sweet messages we can give to others. Thanks for responding back. Are these books available for wholesale? I purchase my CD (Love Covers Machine Embroidery CD) directly from you and after stitching the designs out, I was able to talk our shop owner into purchasing the CD's and template. That template in another great feature to go along with the CD. It makes cutting out the designs so easy!!! You are more than welcome to use my comments. I can′t tell you how excited I was when I saw the new Turning Twenty Around the Block. When I went into the store to get the pattern, I bought some fabric I wasn′t sure what I was going to do with. The more I thought about it, the more I wanted it to be the focus� fabric in the new quilt. I was so anxious to put one together I just found twelve fabrics that worked with it. Before you knew it, I was done! I ended up going back to the quilt store and bought another two yards of the focus� fabric to use as a border. It looks beautiful!! I just bought the backing for it and can′t wait to quilt it! I was still feeling creative so I did another black and white Turning Twenty Again quilt, only this time I used one square of a red and white print. The red definitely gives it a whole different feeling. I am planning another quilt, but can′t decide which pattern or color scheme to use this time. Thank you again for some truly great patterns! My name is Lynne. I have recently purchased your third book Turning Twenty Around the Block from my friend Kim at the Fat Quarter Shop. Lately, I have been wondering what will happen to my quilts when I'm gone. Yes, I'm old, ewww, ick! I read the inside cover of your book and had my answer. Somehow what you wrote gave me great comfort and made me promise myself that I would start labeling my quilts, which I have never done. To think that somewhere down the line, someone that I would never know would wonder who made it and where it came from, made me think that I really needed to start labeling. I have one son and he loves the quilts like I do, but how many quilts can one guy have? They will, of course, all go to him, but I figure he will give some of them away. I have made many quilts as gifts and the response from the recipients is amazing. Some are totally dumfounded and some moved to tears. It really is a gratifying gift to give to people. My husband's sister is dying of ovarian cancer and I made her a quilt to take to chemo with her. To have seen her pull that quilt across the table and just hug it moved me so much. Quilts have such powers of comfort and well being. I have never sold a quilt and never will. They are all gifts to someone if they leave here. I get a lot of flack from people that don't understand and cannot understand why I don't sell them. I'm sure you know why. I thank you so much for that paragraph in your book. You are a blessing yourself. Blessings come to us in many strange and unusual ways. I had to write you and let you know that again you are a blessing and inspiration to me. I bought your new book as quickly as I could and am thoroughly amazed by your insight and thoughtfulness. You may not have intentionally planned it or thought of it, but what a seed you planted. As soon as I saw the new pattern, I knew just what to do. I just finished calling all the troops...ok emailing my brothers and sisters. I am making Mom a Turning Twenty Around the Block lap quilt featuring all of our families (in photos) as block centers. I thought if she had something of us all to wrap her in love it might help when she gets confused. All I can say is thank you Tricia for giving me a way to love and honor my Mom. 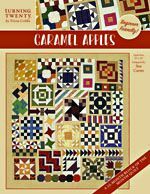 I have encouraged new quilters who come to our quilt class to buy that book, as it is an excellent pattern for a beginner---easy, fast, and beautiful. I am not the teacher. Connie, who wants the fabric you are mailing, is our teacher. She has been teaching the class for about 15 years. It's more like a Fun Tuesday. We meet at the local community college on Tuesdays from 10 am until 4:30 pm. I have been in there for 6 years, but some have been there since the inception of the class 15 years ago! We claim to be slow learners, but the truth is, we have so much fun that most of us are repeaters. We have 19 in the class currently. We solve all sorts of problems! We say that it's the best therapy around, and it's a lot cheaper than a psychologist or a psychotherapist. I am always so proud for you every time I hear about someone making your Turning Twenty. I believe I also heard that it is the Number 1 seller! You Go Girl! Hi I did your Turning Twenty pattern and liked how well you instructed us on how to do it. I am a beginner so I can use all the help I can get. Do you have a suggestion on another pattern that would be easy for a beginner? I want something easy but different with really good instructions like on the Turning Twenty quilt. Thanks and will wait to hear from you. Thank you for the prompt processing of my order for the Funny Farm Fabrics. I did not expect such timely service for such a small order. It was received today in great condition. Turning Twenty is a great pattern. As a group of quilters from beginner to experienced we find it fits us all. We have made a reversible that was auctioned to help cover therapy expenses for a friend who had a massive stroke. The next one went to the Oregon Veterans Home as a comfort quilt. The scrapbag Quilters have also made smaller versions for the nap mats we do for all the kindergarten kids each year. These are take home quilts at the end of the school year. Both patterns have also been used for personal quilts. Thanks again for a great set of very enjoyable patterns. Being a collector of fat quarters I really enjoy them. Love your web site. I purchased the Turning Twenty book today. It's a great pattern for a beginning guilt group we have started in our church. After visiting your web site, I just had to write to you. Your designs are warm, happy and homey with a lovely fresh creativity. They tickle my senses and warm my soul. I especially love your small quilt with the quote, "Give me all your buttons and nobody gets hurt". What delightful warm hearted humor for a button addict. I cannot tell you how many Turning Twenty quilts I have done-although none for me-and a Turning Twenty Again that is at the quilters now. And I may never see it again. She will tell me she lost it. But since it is my sister, she seems to think she can get away with it. I just want you to know that I love your fabrics and your patterns. I am so glad you chose Northcott to do your fabrics because they do such a good job. A funny story and then I will go--I know you don't have time for me to rattle on. I did a Turning Twenty Again in all blacks and whites-beautiful. Only had two problems with it. The large squares were done half solid black and half solid white. They didn't fit when I started putting blocks together. I had looked at something and cut them all too big. Thank goodness it wasn't the other way. Then sister, the same one that will hide my quilt, decided to help and she got her guide block turned sideways and did all of hers wrong, so we had to rip them all out. Could have been done with it in half the time without so much help. I had to write you a short note and tell you I fell in love with your Turning Twenty book--so much so I bought a second copy to give a friend for Christmas--I've been teasing her about it--then you came out with Turning Twenty Again--the day after I saw it on your website I was in a quit shop in Hendersonville, North Carolina called Material Things Quilt Shop and your book was what I went in there looking for--they had it--I bought it--and I love it! I have several sets of fat quarters that were gifts from the aforementioned friend for past birthdays and now I know what I am going to do with them--wonderful patterns! We have ordered books from you and love them! We have had a class on Turning Twenty and it was wonderful! A lot of the students just can't stop making them!! I am almost finished with Turning Twenty Again. I made it in repro fabrics, most picked by my 5 year-old granddaughter. She also sewed some of the seams and did some of the block-to-block sewing on her� little Janome Gem. You can′t imagine how proud she is. This is a great teaching� quilt. I′ll send a photo when it′s all done, for your gallery. I just wanted to let you know how much I love your Turning Twenty quilt book. I bought the book and from the time I started deciding on which fabric to use to completing the top, it took me 3 hours. I cut out 4 more last night and have 25 blocks made. I am doing them with wildlife prints for my 3 sons since they all love to hunt. It will make wonderful Christmas presents. The first one that I made was all florals and it is for my granddaughter since she loves colors and flowers. I am sending it away to be longarm quilted next week. I just strolled through your web site and what a neat place. I am sure that I will be ordering from you in the near future. Love your patterns. I know that God has blessed and rewarded you for your faith in Him. I bought the "Love Covers" book in Katy TX. from a little quilt shop I was visiting last year. Several weeks later I met a lovely lady from Graham named Toni. I had business with her husband and during the course of the evening the subject of quilting was discussed. I shared the fact that I was trying to learn quilting and Toni told me that she knew of a lady who had owned a quilt shop in Graham and was now designing wonderful books and patterns. When she told me the lady's name I remembered my new book. I called her back later and let her know it was the same person. I know this has been the long way around to come back and tell you that you were that lady but I wanted you to know that you have made a difference in people's lives with the special gift that God has given to you and I feel blessed to be an active part of that. I purchased the new "Turning Twenty ...Again" and the "Rusty Garden Heart" pattern in Granbury earlier this month and I'm gathering the fat quarters for my teenage granddaughter's quilt, hope to start soon. Thanks again for the pleasure in quilting that you share with all and may God continue to bless you and Gary as you travel along. I wanted to let you know I am glad that God has blessed you and your husband to do what you love. I had a dream that I wanted to get into quilting but I did not know how to sew but I knew that I could do it if I found the right starter pattern. So I bought a sewing machine and I went to a quilting store in Marietta, Ga called Red Hen Fabrics and they were so wonderful in getting me started. The pattern book that they gave me was Turning Twenty mind you I had never sewn in my life. This pattern was sooo self explanatory that I was able to read and understand each step. Even down to placing the pieces on my sewing machine and sewing the 1/4 seam to at least make my first block. I have signed up for a basic sewing class to help me with the basics as far as reading patterns and understanding the language of sewing. But, I was too excited that I could not wait for my sewing class so I ended up jumping the gun and trying a quilt first. Thanks to your book Turning Twenty it inspired me that I can make a quilt and will be able to continue on once I have my sewing class under my belt. All of that to say thank you for sharing your dream and talent with others. Two years ago my daughter and I made our first trip to the Quilt Expo at Opryland in Nashville. We made the circuit of vendors, saw all the patterns and wares for sale, and my daughter made her decision. She purchased the Turning Twenty pattern. We traveled home after a wonderful day and spent most of the night scrounging through our fabric stash for twenty fabrics. Two days later and with very little help from me, Rachael finished her first "official" big quilt. Hastily we tied and buttoned and she embroidered her quilt label -- it was due the next day for the County 4H Fair. Three days later, Rachael was the Blue Ribbon winner for the 13 and under age group. Now, she has just started high school and made the Varsity soccer team. Due to her soccer schedule, she won't be able to attend the Quilt Expo with me this year. When I asked her what she wanted me to look for she answered without hesitation "that Turning Twenty Again pattern. You know Mom, the new one." I thought this might bring a smile to you and yours. We look forward to your newest pattern this October. I just had to tell you this...I just got back from the fabric store, and bought this quilt book ..just leafed thru it and saw several things that caught my eye (hearts)...got home, opened it up and started reading it, and lo and behold its one of YOUR books - No wonder I loved it so!! Its the "Love and Friendship Quilted Pillows"....OMG, its WONDERFUL...can't wait to start on it!!!! You are so talented! And I'm looking forward to the next Turning Twenty book coming out in the fall.